Thousands of Gaza Arabs rioted Monday night at several points along the border fence, as dozens of boats attempted to breach the Israeli naval blockade of Gaza. 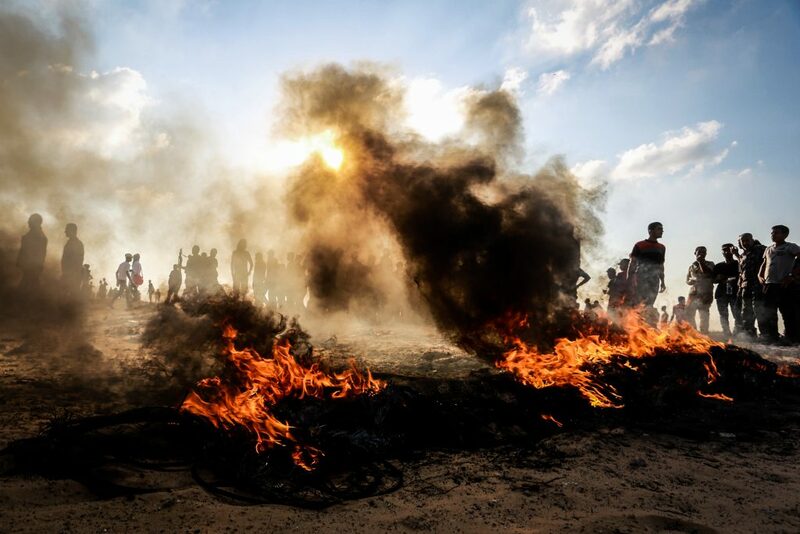 Riots occurred near Zikim, adjacent to the eastern border of Gaza just a few kilometers from Ashkelon, and at the Erez crossing. Israeli forces responded to rock throwing and numerous attacks using firebombs with anti-riot measures. Gaza sources said that 14 rioters were injured. Israel was redoubling its forces in the south, after Hamas and Islamic Jihad said that this coming Friday would be “a day of great testing for the enemy.” On the weekend, the terror groups threatened to increase attacks against Israel, after four rioters died Friday after attacking Israeli soldiers. The IDF is concerned that Hamas could stage riots even before Friday, hence the buildup of forces in the south. On Tuesday, security officials arrested seven Arab residents of Yerushalayim for throwing firebombs at civilians and security personnel. The seven were all youths between 15 and 20 years of age. Besides firebombs, the gang threw firecrackers and other dangerous explosives at Israeli vehicles and at the light rail. Police plan to ask for an extension of their remand. Overnight Monday, security officials said they arrested 5 wanted security suspects in other areas in Yehudah and Shomron. The suspects were wanted for participating in rioting and throwing stones and firebombs that endangered Israeli civilians and IDF soldiers. Several of the suspects were also charged with belonging to Hamas. All were being questioned on their activities by security forces.